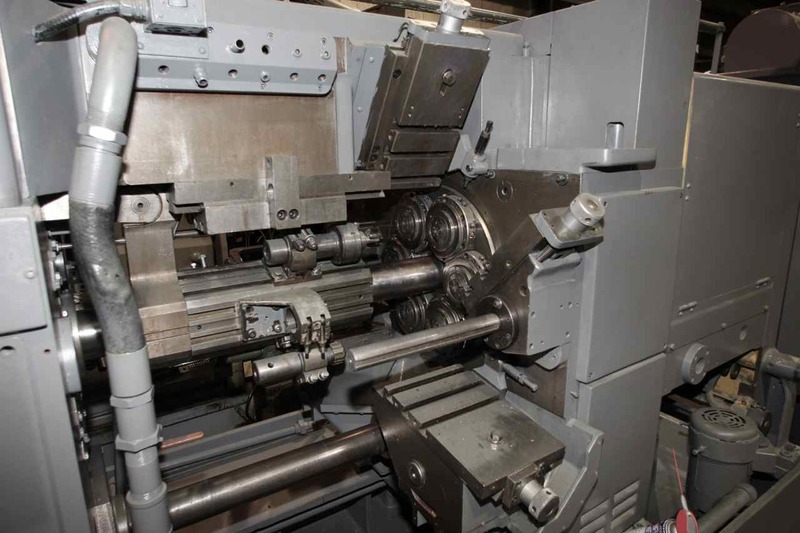 In addition to CNC lathes, Hydromats and newer European multi-spindles such as Schutte, INDEX, and Euroturn, Graff-Pinkert historically has specialized in mechanical multi-spindles such as Wickmans, Acmes, and New Britains. The following is a basic guide to help you choose the best mechanical multi-spindle for your application. The first question to ask when deciding which machine to buy is who is going to run the machine. If the operator is an Acme-man or a New Britain veteran who has only run those machines for decades, it's usually best to stick to the equipment which that operator knows best. However, if an operator is open to using any multi-spindle and they can run the job on a 6-spindle machine, Graff-Pinkert generally recommends using a Wickman. The main reason Graff-Pinkert recommends Wickmans is that it's a much lower cost to tool the machines. There aren’t any cams to change on Wickmans, just lever ratios. You loosen up some bolts, you slide it into the throw that you want and your done. Setting up an Acme or New Britain requires you to purchase many expensive cams and requires a lot of labor to change them out. Another nice feature of a Wickman is that the machine's end tool slide and stem move steel on steel, with meter oil lubrication. On Acmes and New Britains the stem has a bronze bushing which wears, causing play between the end tool slide and stem over time. This play significantly diminishes the accuracy of the parts produced on the machine. So every few years the stems on Acmes and New Britains have to be reground--a process costing a lot of time and money. Another advantage of a Wickman is the ease in adding attachments to the machine. When you add attachments to an Acme or New Britain you have to bore them in line with the spindles--very labor intensive, while on a Wickman, you can transfer an attachment from one machine of the same size to another, just by bolting it on. It may be easier to find setup men experienced on Acmes, but if you can get an Acme setup man to try working on a Wickman, they are usually going to love it. Also, it's usually easier to get spare parts for Wickmans (Graff-Pinkert can supply just about any spare part you will need). Despite the flaws mentioned above, sometimes an Acme is the best option. Acme produced a large range of 8-spindle machines over the years of many different sizes, ranging from 3/4" to 4". There are much fewer 8-spindle Wickmans on the market, and they are only available in sizes of 1" and 1-3/4". People have historically bought New Britains because they are considered well suited for running high RPMs. Brass guys seem to love New Britains for that reason. A New Britain or an Acme in good condition can be a great a machine for you. Sometimes the best machine for the job just comes down to personal preference. Many shops like Davenports for their speed as well. Davenports are small 5 spindle machines, with a ¾” maximum capacity. Their major flaw is that they're light duty, so if you push them hard you have a tendency to break things. In contrast, a small and also fast 5/8” 6-spindle Wickman is twice as heavy as a Davenport. A wreck on a Wickman may mean burning up a tool, but a wreck on a Davenport may mean broken castings. If you run Davenports and you don’t have a Davenport repairman in-house, there is a good chance you will need one soon. Questions: Which multi-spindle do you like, and why? Are multi-spindle chuckers still viable? Stay tuned for future blogs on the advantages of CNC Swiss, CNC turing centers, European multi-spindles (CNC and Cam operated), and rotary transfer machines. Rex Magagnotti has been selling multi-spindle screw machines for 30 years. He has worked at Graff-Pinkert for 20 years.